Spend time in the trenches with David's Mighty Men, learning how to fight for Jesus. Heard the one about the guy who wrestled a lion in a pit on a snowy day just for fun? Or about the guy who took on a giant Egyptian twice his size? Or the three special ops ninjas who risked their all in enemy territory - just to get a bottle of spring water for their General? These are just some of the startling exploits of the Mighty Men who fought alongside King David. The stories are gripping, astonishing and powerfully brought to life in the pages of this book. But these are not just bed-time tales of heroic men from a lost age. They are stories that shine a powerful and sometimes uncomfortable light on what it means to be a true man of God – a Christian – today. Read it, reflect on it, think through the implications by yourself or with others to train yourself for the greatest battle of all. Oh yes, and what's so special about a bean field that would make you want to stand your ground alone against a slavering horde of Philistines? I had purchased 10 of these books for our men's meeting, so far the reviews from some of the men that have read the book was excellent. I have read the book and found it to be inspiring, exciting and also helps you to re-focus on God. So glad that I bought these books, well worth it. I would encourage every man to read this book, its the ideal tool on our Christian pathway. A good book for the faint hearted man! Gritty, punchy and (to use a good old welsh expression that I'd not heard in years) at times just chopsy! Perhaps a best read for younger men who learn bravado and bravery are for men but forget that the bravest and yet humblest is non-other than our captain and king, Jesus. I had some reservations when I first picked up this book, as it seemed to promote an oversized masculine Christianity. What Dai actually does is brilliant. He engages men where they are at, using a mostly unfamiliar part of the Bible, with clear, punch in the face applications that make you just beg God for help where you have definately failed. Particular stuff on humility and legacy hit me between the eyes. A few men at church have been reading it in the hope that, God-willing, we as older guys can try to model a Biblical way to be as a man for a younger generation and those on the fringe. Great book, and particularly to see something come from a fellow welsh man! Very enjoyable book. Easy to read, engaging content and written honestly. This is the best book about how to be a godly man that I've read in recent years. I love the fact that Dai keeps us focused on Jesus but at the same time gives practical and tangible pointers on what it means to serve and follow Jesus. Will definitely be recommending to others. I will be wholeheartedly recommending this book to the teenage boys I work with, but I think people from any other demographic will greatly benefit from it. The incredible stories of David's mighty men are told engagingly and applied well. We are kept safe from just being given role models but always pointed to Jesus, who has won the victory for us and whom we now serve in love and devotion. I bought this book as a gift for my husband. He has not stopped raving about it and has recommended it to all the men he comes into contact with. This book is a great antidote to the all too common problem of complacency and half heartedness, which seems to be the disease of the age. It's an easy and enjoyable read (maybe a bit close to the bone in the eyes of some at a few points, but on the right wavelength for others because of that) and serious about Christ centred truth. There is real honesty from the writer, and it is the kind of book that helps you to think about the real core issues of your walk with Jesus - not about outward conformity, but about inner heart and life. And it offers you hope. You come away feeling that although this kind of courageous living is going to be tough, it is also now within your grasp because of Jesus, and because of the help you get from the 3000 year old examples which the book brings to life. Really encouraging and helpful, and could be used hugely among a new generation of men who need to know how to follow Jesus but wouldn't pick up many other less accessible books. This is a book every man who calls themselves Christian must read! Honest, frank, easy to read, practical, funny and (oh yeah!) so true. It is a book that will stir every 21st Century Christian man to get off their backside to fight and give their lives for Jesus. This is a book for Christian men, it isn't an evangelistic book -it will however inspire you to evangelism. It's a full-on, in-your-face, no-holds-barred consideration of what it means to be a Christian man. The chapters are short and punchy and the writer draws both on personal experience and popular culture. It's lively and often humourous - I found it hard to put down.Another good point -for me anyway- was that you don't have to keep skipping back to your Bible, because the relevant texts are there for you. So the format is easy to live with -the content however is consistently challenging. It poses some awkward questions. This is not a life-style-manual in the normal sense -it's anything but normal. "The Hard Corps" is practical, challenging and motivational -and did I mention that there's a "Combat Training" section at the end of each chapter? Worry not. It's helpful and straightforward -you don't need a PhD to unpack it.The book is unashamedly Christ-centred, Jesus is woven into every chapter, Dai's launch pad for his consideration of Christian living for men comes from David's Mighty Men, found in 2 Samuel. If you are at all un-nerved by the robust writing style let me assure you that there is far more here than a tsunami of testosterone. Grace and humility are well to the foreground, though this only becomes apparent as one turns the pages. So be perpared to have prejudices challenged -your sensibilities might be ruffled- get over it. It's hard to be complacent after reading this. There are men in your church that will be mightily blessed through reading this book -could you be one of them? We live in a world filled with distractions. Whether they're good or bad is irrelevant, either way they tend to take us away from the important things in this life, namely the cause of Jesus Christ, the power of the Gospel and the hope of glory. We're often aware of this most acutely after we read a book or hear a particularly penetrating message that gets at the heart of our own personal struggles. If we're honest with ourselves, it's not that we're uninterested in becoming a soldier for King Jesus and joining in the battle. Before we get out there on the front lines, we have some problems that need to be dealt with. First up is our feelings of unworthiness, shame and guilt. The reality of our situation is that in the face of a holy God, we are unworthy. We've all done things that have rightly left us filled with shame and guilt. Try as we might, we're unable to clean ourselves up. We're a lot like that white t-shirt covered in grease and grime after we changed the oil in our car. No amount of washing with detergent and bleach is going to make that t-shirt white again. Does this mean we're doomed to a life of despair, because we're unable to clean up our own act? No, this is exactly the place of realization each of us needs to come to. The truth is we can't do this on our own, it's impossible. That's precisely why God the Father sent his precious son Jesus to this earth. He came to seek and save the lost. That's you, that's me, we're all lost. If this is all new to you and you're still in that place where you're trying to clean yourself up, I recommend you take some time and read through the Gospel of John. As you make your way through this gospel, ask God to help you understand what you're reading and that He would reveal to you what bearing it has on your life. Undoubtedly, you're going to have some questions about what you read in the Gospel of John and other questions about what it really means to be a Christian. When you find yourself at that point, seek out a friend or acquaintance who you know is a Christian and ask if you could meet with him or her over coffee to discuss what you've been reading and learning. If there are questions that they are unable to answer, you may also want to ask them to introduce you to their pastor, who I suspect will be more than happy to speak with you about the gospel and the life-changing transformation that occurs when we come to know Jesus Christ as our Lord and Savior. Whether you're a brand new follower of Jesus Christ or you've been a part of God's family for quite some time, there are times when we find ourselves in a place where we're feeling spiritually stuck and complacent. I know this was me during my early days as a follower of Jesus Christ. For me what was really lacking was mentoring and instruction on how to live as a man of God. Let me rephrase this using the army analogy found in The Hard Corps: Combat Training for the Man of God. It's like we're enlisted, we passed the physical, but we've been sitting at the bus depot waiting to be transported to basic training. Well soldier, your day has finally come. In fact I hear a bus pulling in to the station right now. It's big, it's green and it has a white and orange Good Book Company bumper sticker on the back. You better stand at attention! Drill sergeant Dai Hankey is stepping off the bus right now and he's coming your way. He told you to grab your bag and head to the bus, so you better get a move on. The bus is full and it's time to move out of the station. I bet you're feeling a little excited and a little nervous at the same time. In the end you know this training will be worth it. *Shammah - He made a stand against the Philistines in the midst of the lentil fields at Lehi. After all it's the promised land, these are God's beans. *Three Nameless Ninjas - The 3NN were willing to sneak behind enemy lines to bring their King a glass of water from his favorite well in Bethlehem. As you are nearing the end of your basic training, you're likely going to feel pretty good about yourself. It's good to be confident. You've made good progress, you're achieving goals, but remember this is just the beginning. When the training is over, it's time to begin your mission. You're probably thinking you'd like your name to be listed in the hall of heroes that you saw in the lobby on your way into camp. It's possible, but it's a lifelong pursuit. As you begin applying the training you learned in The Hard Corps, it's going to impact all areas of your life. The legacy you will be leaving for your family, your community, and the Church is going to be far different now that you're a fully trained solider in the service of King Jesus. Following this training, remember to fully stock your armoury with the weapons (books and other resources) talked about at the end of your training manual. These will help you to always remain sharp and on mission. 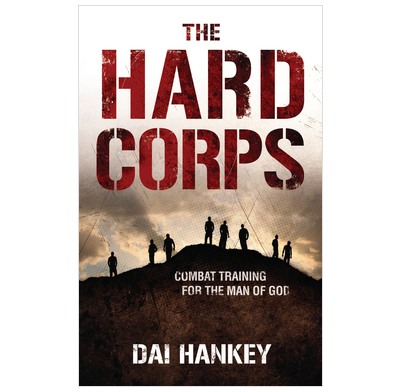 Many thanks to Dai Hankey for writing and The Good Book Company for publishing The Hard Corps: Combat Training for the Man of God. This is a book I wish I had been able to read in my late teens to early twenties. As Christian men we all need to respond to the call to be drafted into the service of King Jesus. Dai's style throughout is entertaining and engaging. The military theme and graphics in the book make this a fun read for both young men and those of us who are still young men at heart. Whether you're 15 or 50, you'll find much to benefit from in these pages. If you're a Christian man who's tended to stand on the sidelines, get yourself a copy of this book and read it. If you have friends and family who would benefit from this book, consider hosting a small group of men in your home and work through the book together. If you have a men's ministry or some men's small groups at your church, get copies of The Hard Corps into the hands of your leadership. As Christian men, we need to be in community, praying for one another, and sharpening and challenging each other. I pray that The Hard Corps would be a catalyst that God uses greatly to kick us out of our apathy and complacency towards unashamed, life-long service to King Jesus! Dai Hankey is a DJ, a rapper and a church-planting pastor in the Welsh valleys, where he lives with his wife and four young children. He is also part of the Acts 29 network and runs Porterbrook Training in Cardiff. This book was provided by the publisher for review. The reviewer was under no obligation to offer a favorable review.